IMG_2150, originally uploaded by All Things Mimi. Firstly, let me say that I realize fried food isn't particularly good for me. Secondly, let me say that I don't eat it very often. Thirdly, let me say that when I do eat it, it should be as good as this was. Love's Seafood Restaurant has been around forever. They have a beautiful spot on the river and the views from the indoor and outdoor dining rooms are wonderful. The food is pretty much all fried (but you can pay a little extra to get things broiled)- but it is fried to perfection. I really do mean it's perfect. Nothing is every over-fried or tough. 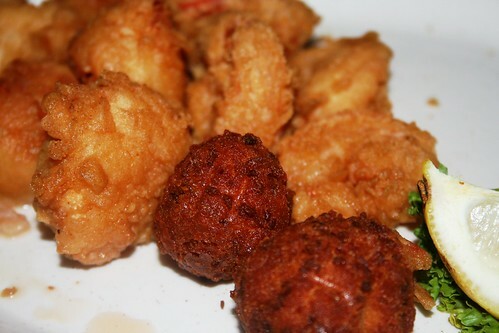 The shrimp are plump and juicy and crispy on the outside. The sauces are good, too. I have no idea if they make them or if they buy them, but I do know that the tartar sauce is excellent! If you ever find yourself in the Savannah area and want some perfectly fried seafood, please, please, please get to Love's as fast as possible. Oh- and wear your stretchy fat pants- you'll need 'em.